Beginning in January of 2013, $55 billion in military budget cuts are set to take place. These cuts in military spending are only a fraction of the $487 billion in projected defense spending reductions set to take place over the next 10 years. Of the major defense contractors, almost all but one get over 50 percent of their sales from the U.S. government, Northrop Grumman being the largest at 90 percent. On August 16, 2011 Bloomberg reported that nine of the biggest names in the U.S. defense industry, who receive more than 70 % of their revenue from the federal government, will face significant challenges to their existing business models because the defense industry will likely be the hardest-hit by Congress’ decision to cut trillions of dollars of spending. In order to navigate the new economic terrain of the aerospace and defense industries, these large firms must look internally to reduce their operational expenses. Mainstream energy-efficient lighting and HVAC products are now available to greatly reduce energy use in these industries’ facilities. BAE Systems has chartered a course that should serve as a blueprint for all of these firms. By taking an aggressive stance towards energy efficiency, BAE Systems has achieved as much as 48% reduction in their utility costs at one facility, which, when integrated with tax savings, helped to stimulate a company-wide sustainability and energy efficiency program engaging all employees. By using a three-pronged Utility Cost Takeout (UCT) approach – including utility cost savings, tax savings, and employee engagement – towards achieving its energy saving targets, BAE Systems has also been able to achieve a “triple bottom line”: reducing carbon emissions, improving the work environment, and saving millions of dollars in operating expense. For these accomplishments, BAE Systems has received several prestigious awards, including the Sustainable Business Institute’s Seal of Sustainability, the National Pollution Prevention Roundtable for Carbon Reduction’s MVP2 Award, and a Company Chairman’s Award for carbon reduction, building energy management, EPAct tax deductions, and its innovative UCT process. One indicator of success is BAE Systems’, Greenlawn, New York facility’s Energy Star rating, which has steadily risen over the last several years from an initial 57 to a current 94 rating. By following BAE Systems’ lead in making strides towards greater energy efficiency, the nation’s leading aeronautics and defense contractors will set themselves up perfectly for large federal tax deductions, on top of their already-substantial utility cost savings. Pursuant to Energy Policy Act (EPAct) Section 179D, aerospace contractors and manufacturers making qualifying energy-reducing investments in their new or existing locations can obtain immediate tax deductions of up to $1.80 per square foot. There are many factors contributing to the success BAE Systems has achieved with its Utility Cost Take-Out program to date. The UCT program, which originated at BAE Systems’ Greenlawn, New York facility, is an integrative process wherein the energy management team aims to decrease utility costs and lower operating expenses by addressing utility costs, utility rebates, and tax savings from the outset. Each of these elements was built into the BAE Systems energy planning model. The team’s strategy was to identify and implement “quick wins” that did not cost a lot of money and had short payback periods. The process was geared towards making incremental but meaningful changes with a focus towards making site-wide changes. The demonstrated success of the UCT process at the Greenlawn site enabled BAE Systems’ energy management team to expand the program across its other facilities located throughout the country. After embarking on the UCT program, the company combined a 100% room-by-room approach with a standard facilities approach, which has enabled them to simultaneously focus on small details like motion detection and larger building-wide improvements like facility-wide energy-efficient lighting, HVAC, and building envelope improvements. The room-by-room approach involved auditing each and every room within a building to find sources of energy waste, which can come either from energy-inefficient equipment or operating behaviors. After completing UCT audits, the energy management team can devise solutions specifically catered to that room and that facility. The holistic room-by-room approach has resulted in BAE Systems, achieving utility cost reductions of more than $3M in the last few years. Additionally, significant EPAct tax deductions were generated due to the integrative design and because BAE Systems understood the prescribed energy reduction targets before undertaking the UCT program. When combined, utility cost reductions, utility rebates/incentives and EPAct tax savings all contribute to the economic portion of the “triple bottom line”. 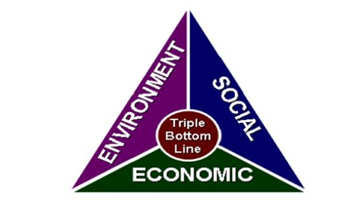 The three components of the triple bottom line, as illustrated below, are 1. Environment; 2. Social; and 3. Economic. BAE Systems has taken the approach that a clear focus on cost reduction will also result in environmental and societal benefits as a natural outcome. Sean Delehanty, Manager of Sustainability/Energy Management for BAE Systems, puts it this way: “My personal opinion is that the winning approach is to make the economic case, and then the benefits for our society and the environment will follow.” This philosophy has enabled BAE System’s energy management team to become enhanced environmental stewards while improving employee comfort and corporate responsibility. Additionally, BAE Systems has embraced the use of cleaner-burning, more efficient energy sources in many of its facilities. This enables them to not only get a longer life out of their heating systems, but also further reduces carbon emissions, qualifies BAE Systems for utility rebates, and reduces their energy costs. One of the most important components of the company’s overarching sustainability program is engaging employees through education and incentive programs. BAE Systems has encouraged its employees to make small behavioral changes that will reduce their energy consumption, things like remembering to turn lights off, using SMART power strips, and using the internal energy saving features of many office-equipment products. They’ve also put up reminders around the workspace indicating which pieces of equipment are considered“energy hogs” and should only be used if absolutely necessary. Further, they have sought to incentivize “green” behavior: for instance, employees receive a discount on their coffee purchases if they use a reusable mug instead of a disposable paper cup. BAE Systems communications with its employees also include business-wide events like Earth Day, Energy Day, and several conferences about the company’s green initiatives. The successes at BAE Systems initial locations made it easily transferrable to a wide audience, the message about UCT’s effectiveness spread first to several of the Electronic Solutions facilities around the country and then to the larger enterprise. The Electronic Solutions energy management team was able to approach senior management with proof in hand in order to make the case for a Company-wide UCT program. As Morgan Rooney of BAE Systems’ Energy Management team says, “We want to get the whole enterprise rowing in the same direction with this initiative." After engaging Energy Tax Savers for its EPAct 179D tax process at the Greenlawn facility, BAE Systems’ energy management team was able to take deductions at nine of its locations across the nation that now exceed $1.9M. BAE Systems has been completely transparent with respect to its integrated tax enhanced utility cost takeout (UCT) program, which is gaining widespread national attention. The result is that the entire aerospace community, including the U.S. defense department, can reap the benefits of this huge cost reduction initiative. By incorporating tax planning into their energy retrofit planning, many of these companies and agencies will also be able to enhance their triple bottom line. Charles R. Goulding Attorney/CPA is the President of Energy Tax Savers, Inc.
Kenneth Wood is a tax analyst and LEED AP with Energy Tax Savers, Inc.
Jacob Goldman is a senior tax/engineering consultant and LEED AP with Energy Tax Savers, Inc.
Donna Cassata, Report: Automatic defense cuts undercut Obama plan, Associated Press, Jun. 7, 2012. Available online at http://finance.yahoo.com/news/report-automatic-defense-cuts-undercut-obamaplan- 203116549.html.